Do you ever get frustrated by food and nutrition? Maybe you can’t figure out why you feel bloated after eating certain foods, have family mealtimes that are mayhem or are unsure about which foods are best for a particular health condition. I call these “food fights” – they represent times when you struggle with yourself or others about what to eat. 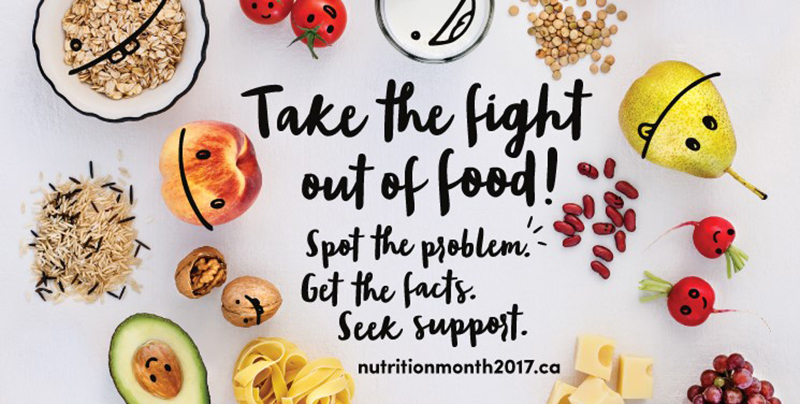 Part of my job as a dietitian is to coach people to calm these food fights, so it is fitting that the Nutrition Month 2017 theme is “Take the Fight out of Food”. I believe healthy eating starts with a healthy relationship with food. Over the next month, I will post examples of these “food fights” and walk you through how to get the facts and seek support. And remember, I’m here to help if you struggle with food or need support to achieve your best health. Visit www.nutritionmonth2017.ca to find recipes, local nutrition month event listings and more.